You have to watch this effect LIVE in lecture to believe it. Just incredible. It's even better than what you see in the trailer ! 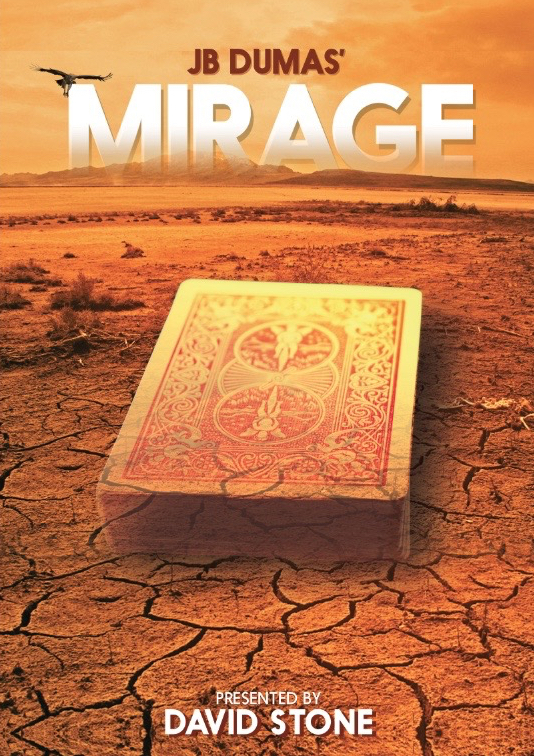 After the amazing success of ZENith, world renowned magician David Stone & underground inventor JB Dumas now offer you a deviously clever card gimmick called Mirage. This newly designed gaff is simple to use, well built, and has multiple applications that you will love performing. Imagine ending any of your card routines by making the entire deck of cards slowly melt into a single card - the selection. Sound amazing? How about letting the deck melt into a four-of-a-kind? Let the deck disappear in slow motion only to have it reappear at your will. People swear they have seen Photoshop in real life! Furthermore you can display a deck of cards, shake it, and make a card box visually appear wrapped around the deck with all the cards inside the box. The possibilities for different effects created with this gaff are endless. Along with two specially conceived Mirage gimmicks, you get a professionally produced video that contains detailed instructions on how to manage and handle the special Mirage gimmick so you fool people every time. Additionally, Stone & Dumas teach you six powerful routines developed to show you the diverse possibility of effects you can achieve with this special gimmick. Also with the help of Jerome Fozzani and Christian Schenk, Stone & Dumas teach extra handlings and touches making Mirage a jaw-dropping illusion for both working professionals as well as hobbyists. - Mirage is ready to use right out of the package. - No suspicious moves needed. - Magic happens in slow motion under close scrutiny. - Specially constructed gaff is as thin as a single playing card. - Gaff may be displayed directly in front of your audience without raising any suspicions. David Stone closes all his paid public performances now with Mirage - it's that good! It might even inspire you to find new ideas and explore fertile grounds in your card magic.